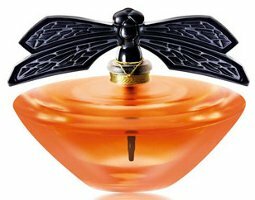 From Lalique, the 2013 collector's edition of Lalique de Lalique: "For this 2013 Limited Edition Crystal Libellule, the bottle showcases an extraordinary dragonfly cloaked in black. The generously sculpted clear bottle is decorated with delicately hand—polished concentric circles, repeated waves of water on which the body of the beautiful dragonfly rests, plunging into the delicious fragrant nectar. A double pair of gracefully outstretched wings draws on an alternating interplay of shine and matte crystal. This entire satin finishing, paired with the geometry of the wings creates a veil of crystal in the Art Deco style." 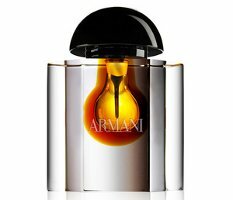 $1800 for 100 ml Extrait de Parfum at Neiman Marcus. From Calvin Klein, CK One Shock in the Street Edition. 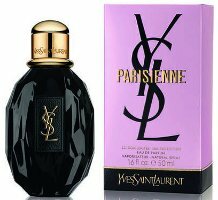 Available in 50 or 100 ml Eau de Toilette, for women (white bottle) and men (black bottle), at Profumomania in Italy. 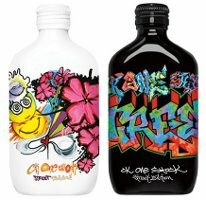 From Clinique, a new bottle for Happy in Bloom: "Happy in Bloom celebrates the spirit of spring, offering a fresh, crisp floral scent that combines key notes of yellow plum, a cocktail of frozen fruit, white freesia and mimosa, plus a whisper of transparent amber and white wood." $48 at Dillard's. From Jean Paul Gaultier, another in the long series of collector editions of Classique. In 100 ml Eau de Toilette, available at Douglas in Austria. I have a bottle of the original Armani parfum and it looks a lot better than this bleeding crystal version. I am curious, though, what kind of IFRA-compliant juice it contains. Just based on the pictures I’ve seen, I’d totally agree…not an improvement at all. That Lalique bottle is stunning. Agreed. Retro in the best possible way. Oh, how I want that Lalique bottle! Ah, how wonderfully striking that Lalique bottle is! Might be my favorite of all of them. Some years they’re really “too too”, this is just right. Totally agree. Maybe they’ll do one of their nice minis of this one, too? I’ve come very close to hitting BUY on the one of those (the stopper with the pair of sea nymphs). If any of you haven’t finished Christmas shopping for me yet, one of those Lalique bottles would be just the thing, thanks. It costs more than my first car! I remember “splurging” on a 2.5 oz. Parure wave bottle w/ bakelite stand when it was new. It put me back $15; a tidy sum in the day. Now, granted, this is stunning, but c’mon! This is not based on perfume or glass artistry, only luxury. At least the price isn’t $1835. That random pricing cranks me up more than the round numbers. You know, when I first saw that Lalique bottle, I thought, “oh, that’s kinda pretty!” Then I saw the price and decided, “meh, not so much!” I think I would have to approach these luxury bottles like collecting works of art, but the down side is you can’t display it without risking the juice! Not a choice I would make. There you go, M.R., giving an adult response. I, on the other hand, woke up from a flu nap and picked a fight w/ a perfume bottle. Ha! I hesitate to say this… but in comparison to historical Lalique designs, this new Lalique looks a bit cheap to me. I know this makes me the killjoy to end all killjoys– but what can I say?. It resembles an awkward Lalique knockoff at best– lacking the sinuous quality of other flacons from this historic designer. I keep thinking “Noir” should be part of the name for Parisienne Édition Singulière…what with the black bottle and all! Not liking any of these. I have to admit I don’t see the dragonfly “properly.” I see a man’s face and neck, head turned to the left, hair parted almost down the middle, with wings sprouting from the back of his head. Gosh. Maybe I need a nap.